A school assignment about slavery at one New Jersey school has parents looking for answers from officials. Candace McCowan has the story. MAPLEWOOD, New Jersey -- A school assignment about slavery at one New Jersey school has parents looking for answers from officials. "I was heartbroken, I had a knot in my stomach," said Tracey Jarmon-Woods, a parent. It's 2017, and Jarmon-Woods hoped she wouldn't hear about a mock slave auction happening at a South Orange Maplewood school. "There was a slave auction and the little girl was put on the block, in 2017, she was put on the block for sale by her classmates and sold and it was recorded," Jarmon-Woods said. Jarmon-Woods is the mother of a fifth grader and tells Eyewitness News she was outraged when she heard what happened in another fifth grade class at the Jefferson School in Maplewood. The incident happened while the teacher was on medical leave, and a substitute was in charge. "So who supervises the substitutes? I guess that was one of the questions that the mom had," Jarmon-Woods said. "Anything that could hurt a kid should be avoided," said Machli Alexandre, a parent. This isn't the first class activity of its type in this district. 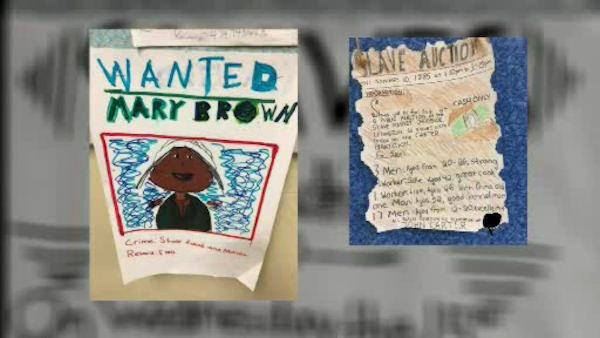 Just last week, at South Mountain Elementary, parents were upset when they saw posters, made by students, advertising a slave auction. It was another fifth grade class assignment. The school apologized in that incident. At Jefferson, parents want answers. "It depends on what the intent is, the intent makes the difference," Alexandre said. "People sometimes were insensitive and everybody doesn't understand," Jarmon-Woods said. The district spokeswoman told Eyewitness News the incident was a student initiative. Jarmon-Woods says history is important, but this isn't how it should be taught. "When we're dealing with the holocaust we would never put Jewish kids in two lines and say you go to the left, you go to the right as an assignment," Jarmon-Woods said. The school released a letter to parents that said in part, "When we had the opportunity to view the full video last week, we were concerned to see how lightly students treated the topic. The jovial nature of the video suggests that either there is a lack of understanding about the true barbarity of a slave auction, or a lack of awareness of how treating this topic comically is offensive." It continued, "We believe that additional work remains to help our students consider how their actions can have a negative impact on others, even if unintended, how joking about slavery is disrespectful to all Americans, especially to the African American community, and that certain matters should be treated with a degree of heightened sensitivity." The letter concluded by saying, "We thank you for your support and appreciate all of the feedback that we have received. It has led us to develop a plan that that we feel confident will turn this unfortunate event into an opportunity for our students to learn and grow. It is important to note that although we want students to reflect upon and own the roles that they have played, this process will not allow for any students to be targeted or shamed in any way. We ask you to speak with your children about their feelings regarding the video, how our choices can impact others, and ways that they can help to foster a sense of respect and belonging for all members of our learning community."